..I am bound to say that the ‘wasp’ chapter doesn’t interest me in the least, and I can’t see my way to a picture. If you want to shorten the book, I can’t help thinking – with all submission – that there is your opportunity. Nothing else was known of this lost chapter until galley proofs emerged in 1974. The proofs were sold at auction and were later published under the title The Wasp in a Wig: A Suppressed Episode. Published in 1871, the book sold more than 60,000 copies by 1883. So popular was the sequel, it has never gone out of print. 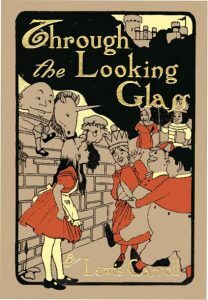 Scholars generally agree that Through the Looking Glass and Alice in Wonderland together changed children’s literature completely. Where books for children were once primarily didactic stories designed to provide moral lessons, Carroll’s books created the genre of fantasy which persists to the present day. The earliest film adaptation which a 1928 version directed by Walter Lang. There was a 1987 animated version of story starring Janet Waldo as the voice of Alice. Mr. T provided the voice of the Jabberwocky. A British television adaptation for 1998 included the lost “Wasp in a Wig” episode and starred Kate Beckinsale as Alice. There have been numerous films made from or inspire by various episodes in the novel. One of the more strange films is “Jabberwocky” from 1977 and stars members of Monty Python’s Flying Circus.